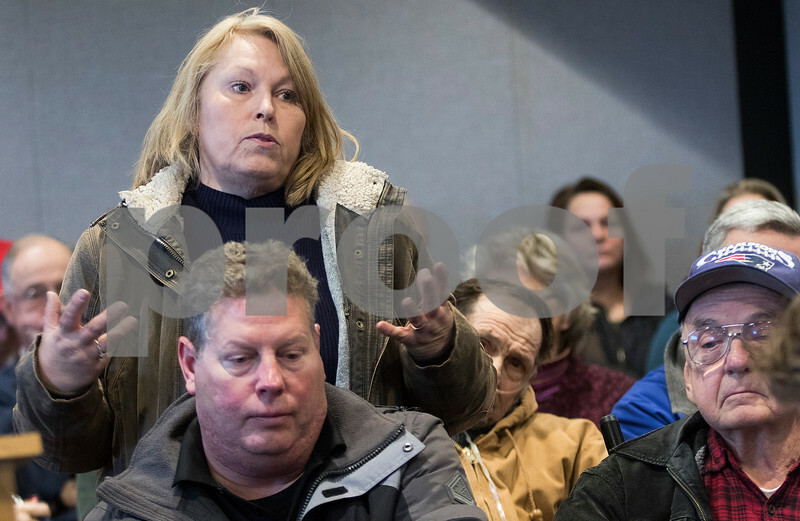 Cindy Brown of South Grove speaks among the attendees during a public meeting on Thursday, January 26, 2017 at the DeKalb County Administrative Building in Sycamore regarding the proposal by EDF renewable energy for construction of two meteorological evaluation towers (MET) in South Grove Township. Brown's father, Bob Johnson, owns ten acres next to one of the towers, which would be constructed approximately 1,000 feet from Johnson's home. The two proposed towers that will be 8 inches in diameter and 200 feet tall will collect wind data to gauge the potential of future wind turbines in the area. More than 60 people were in attendance with all seats taken and more people standing in the room, the doorway, and the neighboring room.